The question is often asked, “where can I find some Red Rum gear”? Well the answer is quite simple. If you want the largest selection of our gear you can shop online at redrumintl.com. Delivery times are from 3-5 days with up 48 hours allowed for processing time. But if you need gear today, then we do have 29 Retail locations across the state of Florida carrying our products. All of these locations are listed on our website here, but we also have included the map for your reference below. 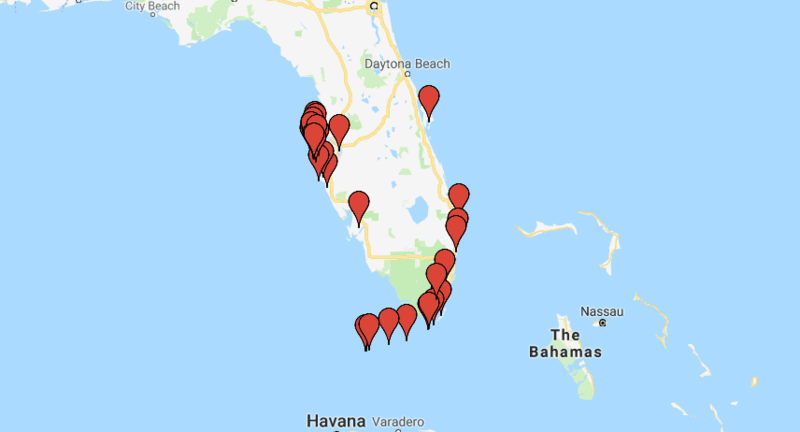 Our retail locations consist of Bait and tackle Stores, Dive Shops, Marinas and Surf Shops, from Key West to Port Canaveral on the East Coast and from Cape Coral to Tampa on the Gulf. We are constantly trying to add more stores to our retail army so if you can think of any that would be a good fit, please feel free to let us know!